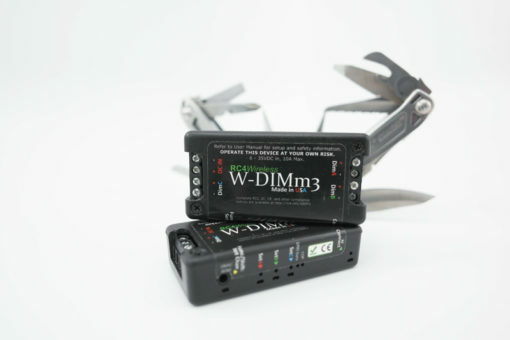 The W-DIMm3 is a super-compact, battery-powered 3-channel dimmer for LEDs, lamps, and motors in small props, costumes, and more that operates on the W-DMX control platform. The W-DIMm3 is an extremely compact, battery-powered wireless 3-channel DMX dimmer on the W-DMX platform that is ideal for dimming lamps, LEDs and motors in small props and more. The RC4 Series 3 W-DIMm3 packs a powerful punch in a small package, thanks to a variety of RC4 Harmonized Design features, as well as the legendary RC4 reliability. 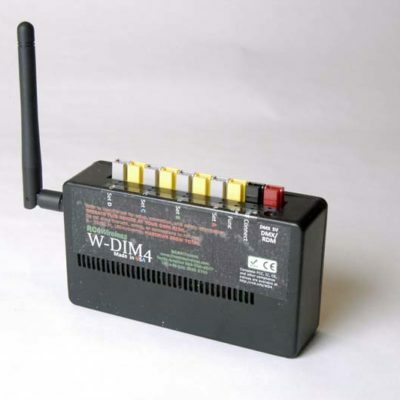 The W-DIMm3 has a genuine Wireless Solution W-DMX radio receiver is built-in, and is compatible with numerous wireless DMX products from a range of manufacturers. 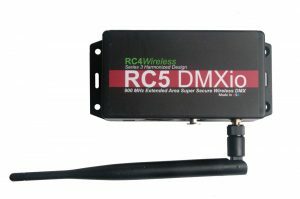 This is the smallest W-DIM unit available from RC4; it includes a built-in radio receiver and uses RC4 OneTouch™ for easy assignment of any DMX channel and dimmer curve to any dimmer with the press of a single button. 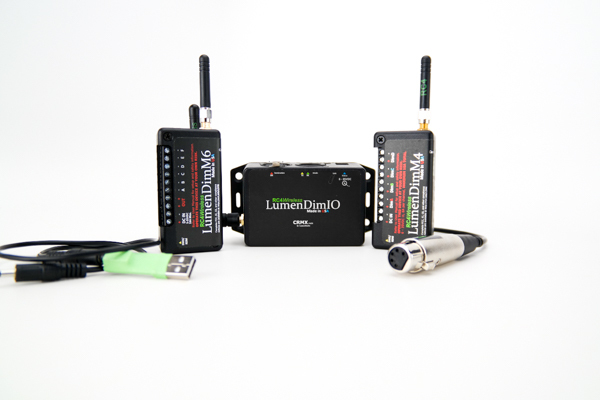 Optionally, device configuration can also be done with Remote Device Management; however, RDM requires an RDM-capable W-DMX transceiver card in the W-DIMm3 and an RDM-capable W-DMX transmitter. Like all RC4 dimmers, the W-DIMm3 features a variety of dimming curves: Non-Dim, Non-Dim Inverted, Linear, Linear Inverted, Inverse-Square-Law , Inverse-Square-Law inverted, servo motor pulse clockwise and servo motor pulse counter-clockwise. The RC4 Series 3 W-DIMm3 provides three dimmers, which is ideal for red-green-blue (RGB) LED color-mixing. The RC4 Hue/Saturation/Level (HSL) Color Controller delivers best-in-class color consistency over the entire dimming range, by ensuring precise primary color ratios even at very low dimmer levels using 16-bit (65,536 step) dimming. Unlike single-channel DMX control of color mix from a console, which is limited to 256 steps and becomes heavily quantized at low levels, the RC4 HSL Color Controller maintains high ratiometric precision throughout the dimming range. Learn more about working with the W-DIMm3 online at the RC4 Knowledge Base. Problematic visual anomalies are easy to eliminate using the four PWM frequencies that are part of the W-DIMm3. Low frequencies (77Hz) are most efficient, and are ideal for high-wattage incandescent lighting. Mid frequencies (615Hz) will improve the appearance of LEDs by eliminating visible strobing in human peripheral vision. High frequencies (5kHz) eliminate video artifacts. And finally, supersonic PWM frequencies (20kHz), though least efficient for power handling, provide PWM dimming without audio interference when used near microphones and electrified musical instruments. 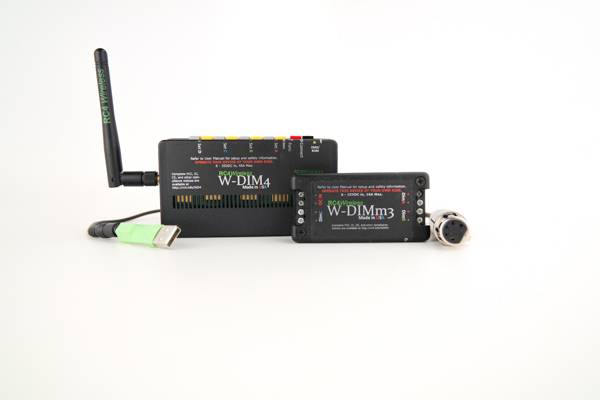 The W-DIMm3 has a wired DMX data port; in most cases, this port is used to output data to nearby fixtures including fog machines, moving lights, and projector dousers. 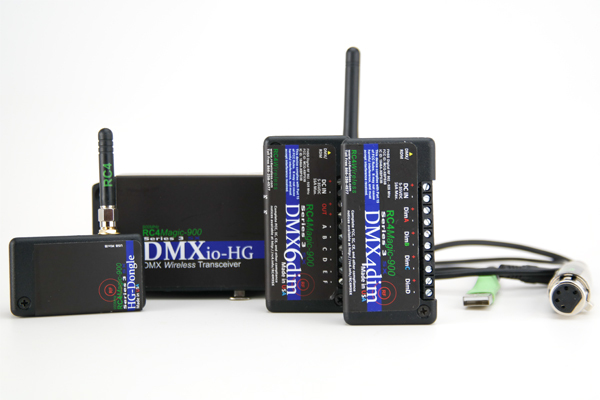 The DMX port can also be configured as a DMX input, allowing the W-DIMm3 to be used as a wired dimmer. Screw terminals are provided for connection of the power supply (+/-DC IN) and load devices (+/-DimA, +/-DimB, +/-DimC). The supply powers both the internal electronics and the connected loads. Dimmers switch on the negative side of the circuit, ideal for common-anode (common positive) LED tape. Dimmer output voltage is precisely the DC power input voltage with no appreciable losses within the 16A total power handling limit of the device. DMX Input/Output: RC4 3.5mm mini, USITT DMX512/1990 data, non-standard port, connector adaptors available. RDM E1.20 and E1.37 (dimmer configuration) support*. 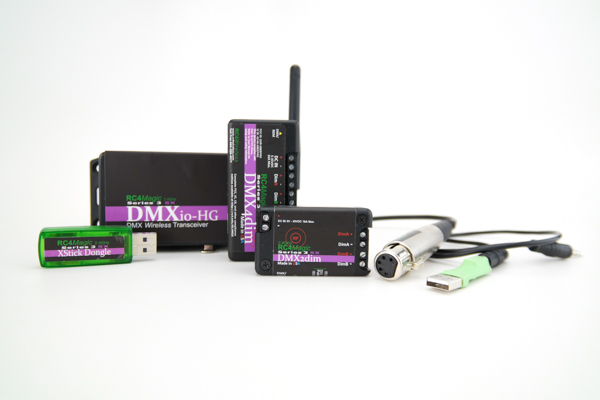 Note: All RDM features are available using a wired DMX connection. 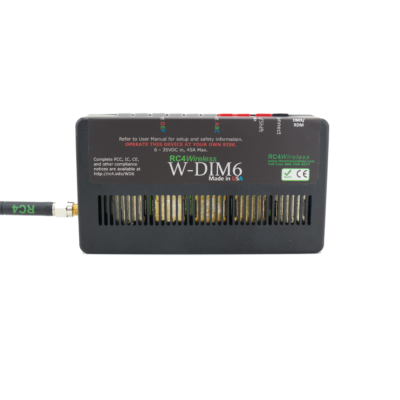 Wireless RDM is available as an option, requiring the installation of an RDM-capable W-DMX card and an RDM-capable W-DMX transmitter.